Canton describes the Ergos as its "timeless classics"
Opening the Ergo 602's carton brought on a very real feeling of déjà vu. 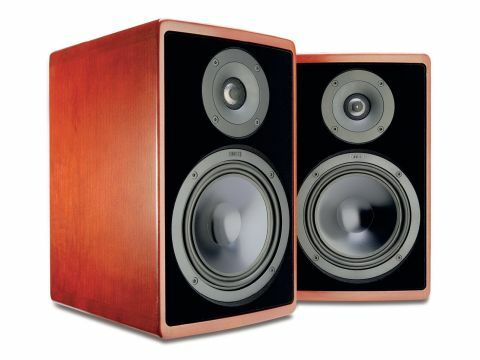 Way back in the 1980s, Canton made an earlier foray into the UK market, and we reviewed some speakers that looked exactly like these. What we found with that earlier model remains mysterious, since in those days computers were primitive devices, disks were floppy, and hard disk drives hadn't yet made it into this particular household. But Canton describes the Ergos as its "timeless classics", where the presentation remains more or less constant while the engineering continues to evolve. In loudspeakerland, everything changes; but in many ways, everything remains the same. It's no exaggeration to say that Canton is the leading German hi-fi speaker brand, and the Ergo is one of its more affordable ranges, though the real-wood veneer finish and classy radiused edges lift it comfortably clear of the beer-budget sector. The Ergo series includes six stereo pairs: the smallest of these (the 601) is a wall-mount intended primarily for surround channels, while the £500 per pair 602 is the smaller of two standmounts intended for stereo use. It's a two-way design, naturally enough, based around a rear-port-loaded 180mm bass/mid driver housed in an attractive medium-size 'traditional' enclosure with an internal capacity of roughly 12 litres. The pretty cabinet with its artfully softened edges is available in either beech or cherry veneer, or in black or silver lacquer. A wooden picture frame surrounds the recessed front panel, and a black perforated metal grille fits flush with the edges, so is best left in place for aesthetic reasons if nothing else. The main driver has an anodised aluminium cone 115mm in diameter, terminated in Canton's proprietary 'wave geometry' rubber surround. The tweeter has a 25mm aluminium/manganese alloy dome, with a claimed response up to 40kHz. Signal connection is made via a high-quality single terminal pair. Clearly best mounted on proper stands located clear of walls, the Ergo 602 unsurprisingly loses out to the floorstanders in terms of bass power and weight, but in every other respect this pretty (if by group standards relatively costly) standmount goes a long way towards justifying its premium price, with a notably neutral tonal balance and very low coloration. German speakers have often tended to have a slightly brighter balance than those which hail from British designers, and that is certainly the case here. This might just be a matter of taste, though there is also a (possibly apocryphal) theory that a brighter than usual top end helps make the consonant-heavy German language more intelligible. Whatever the reason, the 602 is definitely brighter than average, and that in turn does help make lyrics and speech particularly explicit and easy to follow. However, although this arguably positive attribute entirely avoids any tendency for the voice band to sound 'shut in', it also means that the top end is arguably a little too obvious, because this is quite a small speaker and the bass end of things sounds a little dry and underfed. The bottom end is also a shade soft and lacking in punch, though it is both clean and beautifully even-handed. The 602 could perhaps do with a little more warmth and harmonic richness, particularly through the lower registers. But overall its superior smoothness and superb top-to-bottom neutrality, as well as the attractively traditional styling and finish, makes it a welcome addition to today's marketplace that comfortably justifies the asking price. You could draw a ruler line through the Ergo 602's in-room far-field averaged response and see only tiny room-induced variations from flatness - just /-2dB above 1209Hz, and still staying within /-5dB down to below 40Hz. While such impressive flatness is welcome, with the promise of exceptional neutrality, the treble level is certainly stronger than average here, which might not suit every taste or system. And the bass as a whole is rather restrained, in terms of relative level and ultimate extension, which will tend to leave the strong treble that much more exposed. Canton claims an efficiency (as distinct from sensitivity) of 86.5dB, which actually corresponds very closely with our own sensitivity rating of 89.5dB, since the speaker is predominantly a four-ohm load which will therefore be drawing two watts (rather than one) with the normal 2.83V datum that most manufacturers use.